In this topic will be published various useful information. Many have noticed the bottom of the application window line with a bunch of obscure characters. Now I will explain why this is necessary, that the symbols mean and how to use it. The string consists of four parts, separated by a blank space. In version 7.3.6 and lower parts will be three, not four. 1. version GG. In this example, "8.0.1b". It allows you to always know the version of the application in the video, or hacking on screen. What gives? If you have another version of the GG, there may not be any functions or they may work differently. Knowing version, this is easily remedied by setting desired. 2. Status of the demon. "D: +", instead of "+" might still be "?". The issue means that running was not a demon. Whether root cause wait, or root not at all. This option is great for debugging and support. "S: F" - the first search was fuzzy. This option allows you to answer one very simple question - Was there a boy whether to use the fuzzy search. Mainly useful for helping others, but sometimes it helps to guess on screen / video How to search start. Abbreviations are simple enough to understand what is what, but you can not understand, and put at random until the status line does not coincide with the desired value. Actually all. I hope after this material you will appreciate the convenience of this innovation by following the instructions, the authors did not bother to specify which version of the GG or used regions. The annex contains the filters, which is not in any similar application. Currently filters work with Java code. This means that they are not very fast, and can consume a lot of memory. In the future, filters will be improved and rewritten in C.
So, what is a filter? Filters are special rules used to filter the current results. Unlike dropout filters do not affect the status of the search. Once you remove the filters, everything was back to the same state it was in before filtration. What is comfortable? You can search for any special significance, not being afraid to make a mistake and lose the rest. Filters are available on "..." button, click Filter. Then came various filters, which we will consider later. So far, the return to the mechanism of the filters in order to understand why we need these two numbers. I must say about the second - is the number of results you see at the end of the search. It always works, even if you do not select any filter. It is necessary to bring the first 1000 results, please enter 1000 and presses apply. At least 10 million. The value is not limited in any way. But remember, the more results you upload, the more memory consumption. Then the memory is not enough, and the system washes GG. So do not put very many. In this case, we found 8,674,304 results and shows the first 100, and you need 10 000. So you put the filters in the second number 10 000. And get your 10 000 results, and then change them all. And then the game because of it flies, as you there is something broken. But that's another story. Let's go back to the first field in the filters. To understand what it means, you need to talk a little bit about how filters work. So, imagine that we have included filters and found 10 million results. The application will receive the results and check each against all filters. Get results the program is not everything, but no more than that number, which is indicated in the first field. Why not more? Because as soon as the typed number to display, continue to receive will be discontinued. Returning to the example. 10 million total results. Filter we will be 1000, and output 100. This means that there will be obtained the first 1000 results and tested for the filters. Those that have passed, but no more than 100 will show. I hope it is clear. Here you can still make an analogy with a sieve. The first number is the amount that you ship in a sieve, and the second - the maximum amount of results of the last sieve. If it has a screen more than the second number, it will be only the first of them. Skip similar addresses - if this filter is enabled, after the result which matches the rest of filters, will be missed all the results, the distance to less than or equal to the specified number. Let me explain with an example: is the number 10, it fits the filter, followed at a distance of 8 bytes is the number 11, which is under the filter is not suitable, but if you have activated the filter "to pass close to the address" with a value of not less than 8, then 11, also fall into conclusion. What is comfortable? For example, you know that after the number 10 goes to 12 bytes the desired value. You are filtering by value and turn the filter parameter 12. Address > - skips all options that address more than the specified number. This way you can portions of, for example, 1000, to view all found each time putting here the last address of the found variants. Address < - same as above, but applies to all addresses less parameter. Value > - similar and values. Here there is only a small problem - all values are treated as dword, regardless of what they actually are. So this will work fine only dword. This will be corrected once. If the filters are included, there are always three numbers: the first - the number of results found, and the second - the number of results submitted to the input filter, and the third - the number of results past the filters. If the filter is not enabled, there may be one or two numbers. If the number is one, it means that all results have shown results. For example, "(20)" means that we have found 20 results, and they are all displayed. If the two numbers, the first number is the number found, and the second - the number shown. For example, "(20/10)" - found only 20 and 10 are shown first. Let's go back to the filters. I still want to find her 101. Somewhere as it should be. And I do not weed out hunting. Therefore, I will increase the number of results submitted to the input filters. You can now with these values do something - to remember to change or something else. The result is the same as above, as a record of the same filter, just in a different form. This option can be used in almost every place where you need to enter the number: Edit the values of the variable parameters of filters and so on. Tell me, please, how to look for floating matter if the game timer time shows only part of the whole, and after the comma does not show? Game Hacker floating value can search only by the first part of the whole number. What also look for GG? In version 7.2.0, you can search for more / less. For example, to 100.0 without decimal places, looking for all that and more is less than 101.0 100.0. By the way, about the speed of the search. Starting with version 8.1.0 adds the ability to store data in memory. If you have enough RAM available, it can greatly speed up the search (10 times more). However, the application may crash if memory is insufficient. Therefore, this option is not enabled by default. If the application closes spontaneously, try to choose the lesser value, or disable this option entirely. On the emulator, the same as the BlueStacks, memory usage may be slower than the use of files. Try. The search speed depends on the speed of reading and writing to the memory card. Therefore, to seek faster, it makes sense to put as much as possible high-speed memory card. Especially when using the fuzzy search. To make it clearer, citing figures. Displacement of the temporary file, depending on the situation, can reach 100-300 MB and above. Say it 100 MB. This is about 10 million dword values. Normal operation on the file is in its full reading and writing. Typically, reading faster than writing, so I will focus on the recording speed. Take the usual Class 2 memory card on which the maximum write speed will be about 2 MB / s. Record 100 MB will be carried out within 50 seconds. Now let us compare with the 10 class (10 Mb / s) - 10 seconds. Sensible difference. If you take more high-speed card, for example, SDCA10 from Kingston, and there speed (I was to write 25 MB / s) allows you to record 100 MB 4 seconds. Search time will not be less than the figures shown above. Read / write to the memory card. As can be seen, the basic search time is not strongly dependent on the program code, as defined by your device or equipment thereon. As I wrote - to use the fastest memory card. Select only the necessary regions of memory and does not use slow regions (Others) - access to them can be very significantly slow searching. To reduce the maximum amount for the search. after the start of a fuzzy search use the "not equals" rather than "is" because the memory addresses that have changed are always much smaller than those that have not changed. The search is performed on "fresh" start the game, if it is possible, because the longer the game runs, the greater the amount of memory used and the more space for the search. Try not to use the data type to "Auto", because there is a lot of checks carried out, which may be unnecessary in your case. I researched this issue. GK uses memory to store data. The memory card is only used for the first fuzzy search and all. Further, it is not used at all. This decision can not be called successful. Yes, it allows you to quickly search for, but at what cost! Memory consumption is not limited in nature. As a result, the GK flies, the game. It depends on what will beat the system running out of memory. 3. I am fuzzy search. It found 40 million values. But they are in the buffer to disk. There is no problem. Memory consumption demon GK - 1,3 MB. Oh, what is it? GK was closed, and the game is closed. In my opinion, not worth the high speed flight games or utilities for hacking. Imagine that you have achieved some special situations in the game to hack it, and spent time and resources to do so. And then the game went and took off. All for nothing. Maybe all the same, it is better to look for more slowly, but with guarantees that the flight would not be? By the way, I still have this 1 GB of memory on board. What would happen if 512 or 256 MB? All will fly much earlier. 3. I am fuzzy search. It found 14.6 million values (the value is 0 or -1 are ignored, therefore 40 million in GK). Memory consumption demon GG - 774 KB. 4. Now again looking for fuzzy search. I opt for not changed. GG starts looking, memory consumption remains almost unchanged: 774 - 776 - 784 KB. Of course nothing is taken off, since there are no reasons for this. 2. I am fuzzy search. It found 39.5 million values. Memory consumption demon GH - 1.28 MB. Demon GH crashes interface GH is infinite Status. What's funny, the system even with gains GK. Well, at least the game is not relegated lucky today. Absolutely the same situation as with the GK. Conclusion: GG looking for with minimal memory consumption, but slower than the GK or GH, since it uses a memory card. But it ensures that no game, nor an attacker does not fly at the wrong time. What is more important for you, speed or reliability? Decide for yourself. Doubtful plus all the utilities so able. GameGuardian version 7.3.5. Also got the opportunity to drag the icon. Although previously it was possible to change its position, even slightly more sophisticated way. That Yes, until recently, very few people knew how. But again GameGuardian 7.3.5 is able. GameHacker and GameGuardian it can. 4. Search value with the sign "-"
GameGuardian knows how long ago. Someone reads HELP? At the start GameGuardian minihelp opens. In GameGuardian also have "any search settings". GameGuardian knows all this, plus he knows how to search for XOR, which does not know how anybody. 1. Controlling the speed of the game is? No. In GameGuardian there, but only for the ARM. 2. Support for x86-based devices have? Somehow yes, judging by the reviews on the forums. We GameGuardian this is much better. 4. Editing a large number of results once there? No. All that is greater than 500 is not shown. And you can edit GameGuardian least the first 10 000 of found 1 000 000. The main thing that had the memory. Yes, the usual. And GameGuardian 7.3.5 has expanded. Usually, only the increase, decrease and only on the band, in ArtMoney. 6. Displays the status of the search there? No. Sit and wonder, search, or simply goes the inscription on the screen. GameHacker GameGuardian and show the status of the search process. 7. Is it possible to enter a hexadecimal value to search for? No. In GameGuardian you can, if you add the letter h at the end. 8. If the ability to search / produce screenings for conditions other than equality? For example, all that more / less / not equal 100? No. In GameGuardian and GameHacker such a possibility. 9. Can I run 10-20 fuzzy search for equality immediately for screening random values? No. Sit and manually tap. In GameGuardian such a possibility. 10. What is the situation with the transfer and support? And in any way. If not translate enthusiasts, there will be Chinese. Developer there. Bug reports or suggestions for improving writing nowhere. And what we have in GameGuardian? 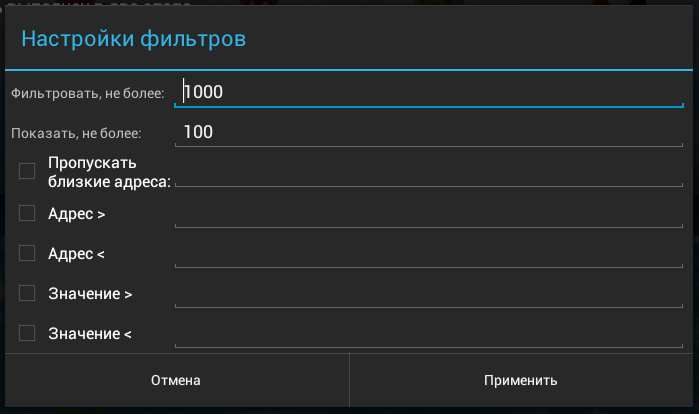 Developer online, normal Russian (and not only) in the language of the official version, you can write bug reports and something to offer / ask for. 11. Can I make an icon GK was not visible on the screen (some anti-cheat do screenshots)? 12. You can adjust the transparency of the icon? 13. Specify the path to a temporary file, you can (for example you have two cards and the first goal)? 14. You can find these regions? No. There is something unintelligible, called as an upper limit, but it is not the regions, and a certain amount. A GameGuardian possible. Perhaps enough. Do not pull the GK on the "best of its kind." I would be glad if you can prove otherwise. In version 8.0.1 has been modified search mode auto for floats: if you enter an integer, float search occurs without a fractional part, like GameKiller. This allows you to quickly find the float values rounding. 1) The value is not encrypted and known. A typical case would be for money, stars, coins, resources, etc. 1. Search Type - "Known". Data type - usually, Auto, if you are not sure. 2. Open GG, search for the number that we are want change in the game. This will find a lot of values. 3. We return to game and making changes in the game to crack parameters: earn or spend. 4. Re-open GG and search again for the new value. 5. Repeat steps 3-4 until there are only a few values. To speed up the drop-out extra values, I recommend using different ways to change the value on 3 step. For example, alternative way for change hacked value. 6. If you have only a few values - change each one, or all of them at once, or however you want to do it. That is all. 2) The value is unknown and/or encrypted. A typical case of an unknown value - any scale/bar. For example health, mana, nitro, etc. The changes are seen, but no numerical values are visible. A typical case for encrypted values would be money, stars, coins, etc., but when searching with 1 algorithm does not find anything, or change of found values do not lead to changes numbers in game. 1. Search Type - "Unknown". Data type - usually, Auto, if you are not sure. 2. Open GG, run a search for the unknown value. This will return lots of search results. 4. Re-open GG, in search of the unknown value, select the desired option: "Value changed". Here it is possible to use variants of "Value increased" or "Value decreased", if you truly believe the value is changing one way or the other. However, I want to say that things are not always as they seem. For example, instead of accounting for the life of the character, it may take into account the damage received, and this value increases with a decrease in life. Therefore it's safer to use variants of "Value unchanged" / "Value changed", because that issue doesn't affect these search types. 5. We hide GG, in the game we do different things that do not change the hacked value. It is desirable that they are complicated and can change all other parameters expect hacked. 6. Open GG, in search of the unknown, select the desired option: "Value unchanged". 7. Repeat steps 3-6 until there are only a few values. To narrow down the results faster, I recommend using different ways to perform steps 3 and 5, because it can more effective rather then run same action every time. For example, drive a race to earn money and then drive a race not earning money. In fact, you can change a lot of parameters, and what there can be, according to the difference between them, to understand which one is correct. 8. If you have a few values - change each one, or all of them at once, or however you want to do it. That is all. 3) The value is encrypted (Mode Hacking). 1. Search Type - "Known". Data type - usually, Dword, if you do not know anything further. 2. Open GG, select "Mode Hacking", search for the number that we have in the game, will find a lot of values. 4. Re-open GG and again search for the new value. The checkbox "Mode Hacking" must be selected. 5. Repeat steps 3-4 until there will be little value. To speed up the drop-out extra values, I recommend to use different ways to change the value on 3 step. For example, alternative way for change hacked value. 6. You have small count of values - change, or all at once, or what we want. This is all. 3 algorithm is much faster than 2, but it may not work for all games. 3. Try to crack using known search (1 algorithm) for a value in memory. 4. If nothing is found, or a change in the values found does not lead to the desired results - try to crack using a unknown search (2 and 3 algorithm). If, however, in which case nothing is found, or a change in the values found does not lead to the desired results - try to crack not the option, but that affects him. For example, instead of breaking amount of money, you can crack the value of a thing and sell it. Or rather buy a negative price. There may also be doned with a known or unknown searches. If you press it, the selected process will be put on pause for as long as open interface GG. If you minimize the interface with active pause, the pause is switched off, but when you open it will be automatically activated. In the settings you can specify the path to a temporary file. The path can be absolutely anything, even wrong. The program makes the list of the most common ways that can be used. Your version will be the first. Further, each path in turn tested for the ability to create a file and write data to it. As soon as there is an appropriate way to further the search stops and the selected path is set as the desktop. The list includes ways to common folders are usually available for recording. Not all of them are located on the external drive, most of them are in the device memory, which allows the application to work when the memory card is damaged or removed. In application settings you can adjust the time to hide the icons and transparency. If transparency, everything is clear, with a hidden, not all clear what it is. Hiding is to establish full transparency for the icons, after a specified interval. The icon does not disappear and is at the same place where it was, just that she is 100% transparent and not visible. But it is still possible to click and call the API. This behavior can be useful when working anti-cheat, take screenshots of the screen. Or when you do take screenshots and do not want to show that started cracking utility. For some functions organized by applications access. 1. To select an application to break, you can click on the icon in the upper left corner or the name of the application. 2. To set the number of results displayed or set filters, you can click on the counter of found results. 3. To select regions of the search, just click on the status bar at the bottom of the interface. Not all features are visible in the interface and some of them can be skipped if you do not know. In most cases this is due to long tapom on different elements. 1. Long tap the application icon opens the interface speedhack. He and hides it. 2. Long tap on counter speedhack resets it back to normal. 3. Long tap on the search result, or stored value and the editor memory cell, a context menu with the copy and go to to the address. 4. Long tap on the log tab, copy text to the clipboard. Why should I choose to help improve GameGuardian? Because it depends on what will be the application. Whether you like it or not, you have to use it. The fact that the main counterparts: GameHacker, GameKiller and GameCIH - abandoned. With the support of the fifth android above them all bad. And the further, the worse the picture. The seventh android (for example) they can even refuse to launch. There are CheatEngine. But there are problems in bulk. Starting with the fact that its development is also at issue, ending with the fact that his discovery by anticheats extremely banal - for binary ceserver. Well, there is not much interface is well done. Therefore, if you are not making any effort to improve GameGuardian, then you have to use what we have. At the moment, GG is the most stable cracker available. I am more than sure that nobody collects errors, analyzes them and making all the possible changes to the attacker worked almost everywhere. Yeah, he's not the fastest, and there still is not much, but once Moscow was built. Therefore, if you have specific suggestions and improvements - are welcome. Write, we will think and discuss. And if earlier Water was wet but the grass is greener cracks were better because it is better and you are not able to articulate anything specific, then alas. To be clear, the statement should answer the simple question, "what to change to become better than GG was?". Adoption in the style of "GH is better, because it is clear", and formal; it can not be implemented, as opposed to "at the GH spidhak available slide to the left and it shows, in contrast to the long tap on the icon GG". Or "To find in GK I do not need to click on the search button, I can immediately enter the number to search for." Therefore formulate their wishes and concerns specific and not vague abstractions that each person has his. In GameGuardian there are unique features that are not, in any other similar utilities. "Hacks" I'll be the application TapCounter. Its essence is simple - it counts the number of Taps on the screen. The perfect object for hacking. We assume that the value is not changed to crack. A typical example - the price in the store. Here I am 47 tapov self-fulfilling. Now I want to do to make it 200. I enter in the search found dword 47. 370 values. Too much. But to change the value, I can not, so I can not weed. Just then comes to the rescue and change all values. Now I have uploaded the first 100 values. Only try to change them. You can not put 100, and the other numbers if the tap on the number found. So, open edit all values. Here we are interested in the "increment". The default is zero. What does it mean? This is the number that will be added to each value multiplied by the number in the list of results starting from scratch. Let me explain what that means with an example. We have three numbers. The value is 47. The increment is 0. If you change will be recorded 47, 47, 47. 1 - 47, 48, 49. 2 - 47, 49, 51. 10 - 47, 57, 67.
n - 0 * 47 + n, 47 + 1 * n, 47 + 2 * n.
What do we need? Check the variable address. How do we do? We assign increment 1 and see the new value in the game. We do. The "game" remains 47. What does it mean? The fact that the desired value, we have not changed. In some games, you need to exit / enter on the screen (the store), the change will be displayed. Here, too, the value does not update itself, so I click the first "+" and then "-" that it was updated. To play is not taken off, change all the values back to the 47. Now we need to download the following 100. While the user-friendly interface for this is not, use the filters on the address. Move to the last. Copy the address, making it a long tap. Select the filters and activate the filter address our more than copied. Now we see that filtered 200 results, showing 100, and a total of 370. Repeat change the value incrementally. The game once again, nothing has changed. Again missing addresses 100 through filters. In general, repeated as long as the value does not change. We go back to the GG, find the line with the value of 84. This will be the key we are. Click on it. Put a check mark on the preserve. Then again we go to edit everything and the value of 47 is returned to all that the game has not taken off. Clear the search and go to the tab the stored values. There will be our stored value. We put him 200 and enjoy life. You could not dance with the filters and put the number of output is higher than the number of found (370) and change all through the increment. But then the more chance you'll change something is not right, and the game will crash. Of course, she can fly, and so, there could be as lucky. But this method is better than nothing. In total, you can specify from 2 to 8 values. The region should be 1 to 65535. The larger the area, the slower the search and more memory is needed for it. If the region is not specified, it is assumed to be equal to 512. The value can be specified as a number or in hexadecimal with a pointer type, or in the reverse hexadecimal. 10 - 10 type Auto. 10B - 10 with the type Byte. 10F - 10.0 with the Float type. 10X - 10 with the type of Xor. 0Ah - 10 in hexadecimal notation. 0A00hD - 2560 in hexadecimal notation and the type Dword. 0A00rW - 10 in reverse hex and Word type. Contact hexadecimal notation allows you to record the bytes as they are in the memory, not doing their permutation. For example, the number ABCDEFh in memory will be written as EF CD AB. Instead of rearranging the bytes yourself, you can simply write EFCDABr. And it will search with GG. The most simple and obvious use - Search byte string in memory. The maximum length is 4 * 8 - 32 bytes. "6E 6E 62 61 65 64 72 6F 66 5F 6D"
The only negative - will be found all the permutations of these numbers. I found some lessons for GameGuardian on the internet. It made quite well, although in some places there is an mistakes. There's a problem with navigation, so here I will post all the links. GameGuardian. Lesson #1 – Overview, download and installation. GameGuardian. Lesson #2 – Settings, features. GameGuardian. Lesson #3 – Concept of work, searching and freezing. GameGuardian. Lesson #4 – Searching “known” value. GameGuardian. Lesson #5 – Searching encrypted “known” value. GameGuardian. Lesson #6 – Searching grouped “known” value. GameGuardian. Lesson #7 – Searching “unknown” value. GameGuardian. Lesson #8 – Tips and tricks. GameGuardian. Lesson #9 – Speedhacking. Unfortunately, there are only 5 lessons. Unfortunately, author remove this lessons. I save two files from Google cache.